My brother is quite fond of Tesla. This has been an ongoing obsession, but recently the family questioned his whereabouts one afternoon. He went for a test drive. So in the spirit of my brother playing hooky to drive cars, I was inspired: Car blogs! 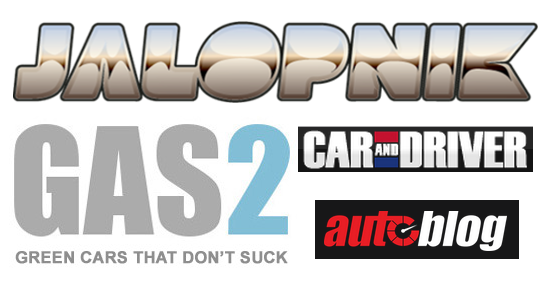 Jalopnik is a fun site. I’m a fan of motorcycles. So the post These Are The Most Powerful Motorcycles You Can Buy in 2015 especially caught my eye. Then there’s this fun piece, also written by Lavrinc: We Need To Make This Lego Caterham Super Seven Happen. It appears Lego fans have the ability to vote on Lego Ideas (“where builders submit model proposals, get votes, and if they garner enough support, Lego might sell it”). Finally, this bit of awesome: Four-Year-Old Fulfills His Dream ‘To Be A UPS Man’ And It’s Adorable. I’d heard about Autoblog before even venturing into the idea of featuring car blogs this week. The site offers car news, enthusiast information, auto shows, and green vehicles. Posts like Top Gear Names BMW i8 Car of the Year, Corvette, Ferrari, Mercedes Also Win Big showcase some of the informative writing that can be had here. Other posts that I found interesting include Here’s the First Production of Ferrari Sergio, and It’s Already Been Delivered (talk about a hot car) and Montana Legislators Pushing for 85 mph Speed Limit. OK, this site presented a car that made me say “wow.” It was specifically to this post: Plug-In Hybrid Tomahawk Supercar Aims to Launch in 2017. What an amazingly pretty car. Gas 2 has some pretty interesting content. Other posts I enjoyed include Volkswagen Mulling Formula One Entry, Revozport Launches Line of Tesla Model S Mods, and Aston Martin DB10 Will Star in Next James Bond Movie. I mean, who doesn’t love that scene, when Bond steps out of a gorgeous new car? Car and Driver Blog is a great online companion piece to the classic car mag. The site features vehicles, reviews, news, video, and a buyer’s guide. The first story I noticed was Can an Electric Car Really Replace Central Park’s Horse-Drawn Carriages? It’s an interesting debate – these horseless ecarriages. Other neat posts include The Race of the Centuries: 2013 Tesla Model S vs. 1915 Ford Model T and Ford is Definitely Working on a Hybrid F-150, Maybe a Diesel, Too. P.S. Ever wonder how we come up with ideas for our blog profiles? Our handy list of industries and subjects on PR Newswire for Journalists stays top of mind. If you’re a blogger or journalist looking for auto news, let us know. We’re happy to customize that feed for you on PR Newswire for Journalists. Christine Cube is a media relations manager with PR Newswire and freelance writer. She’s curious whether people actually give cars wrapped with a large red bow for Christmas or if that just happens on TV. Because if there’s any hint it could be real, she’d secretly be all for it this holiday. Follow her @cpcube.